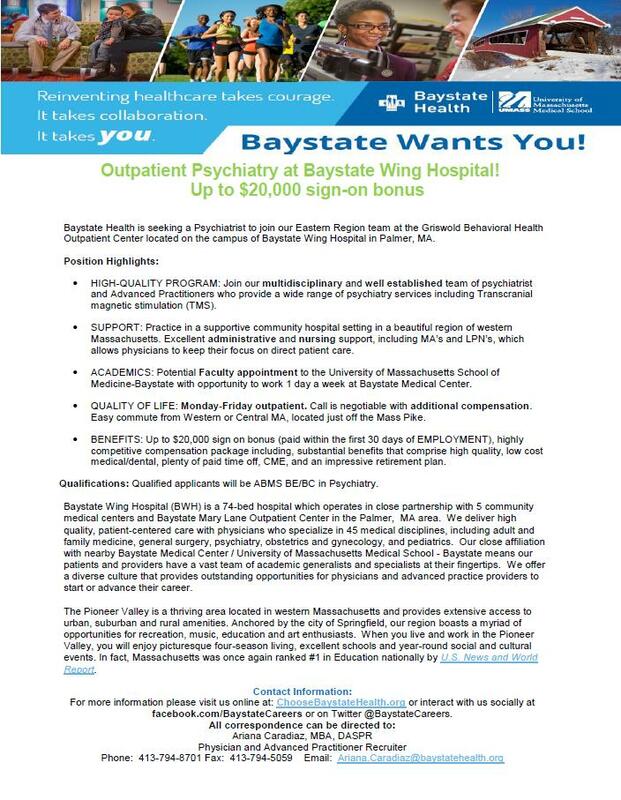 The Department of Psychiatry at Massachusetts General Hospital has an outstanding opportunity for a full-time or part-time BC/BE Geriatric Psychiatrist at the Outpatient (OPD). The OPD provides insurance-based outpatient treatment for geriatric patients with psychiatric disorders. Responsibilities include the provision of direct clinical services to patients and working with their families and multidisciplinary clinical teams. Participation in the program’s clinical development, outcomes measurement, quality improvement efforts, and educational activities is also available. Ideal applicants should have an M.D.-completed residency training in psychiatry and/or obtained Geriatric Psychiatry fellowship training, be board certified for Geriatric Psychiatry in an ACGME approved program. Applicants must have obtained full medical licensure in the Commonwealth of MA., be qualified for an appointment at Harvard Medical School at the rank of Instructor or above, and have unrestricted MA. Controlled Substance and DEA license status. 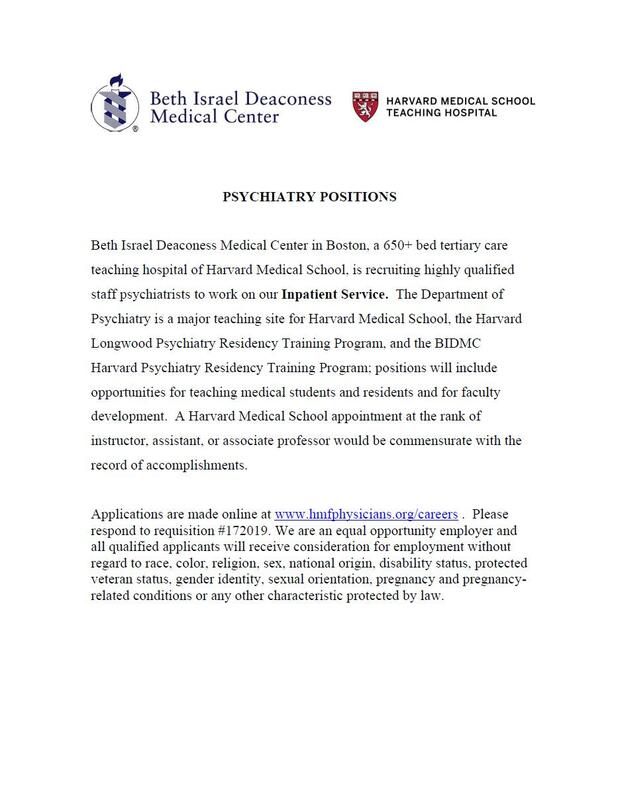 Interested individuals should apply to Jeff Huffman, MD ([email protected]). Applicants with relevant experience will be considered. The Massachusetts General Hospital is an affirmative action/equal opportunity employer. Minorities and women are strongly urged to apply. Cambridge Health Alliance (CHA), a well-respected, nationally recognized and award-winning public healthcare system is seeking full-time and part-time Psychiatrists. Our system is comprised of three campuses and an integrated network of both primary and specialty outpatient care practices in Cambridge, Somerville and Boston’s Metro North Region. Please visit www.CHAproviders.org to learn more and apply through our secure candidate portal. CV and cover letter may be sent directly to Melissa Kelley, CHA Provider Recruiter via email at [email protected] CHA’s Department of Provider Recruitment may be reached by phone at (617) 665-3555 or by fax at (617) 665-3553. Cambridge Health Alliance (CHA), a well-respected, nationally recognized and award-winning public healthcare system is recruiting for the Clinical Director of Addictions Care. Our system is comprised of three campuses and an integrated network of both primary and specialty outpatient care practices in Cambridge, Somerville and Boston’s Metro North Region. Qualified candidates be board certified in Addictions Medicine with a minimum of 5 years of progressive clinical leadership experience in Addictions Medicine. Possess excellent clinical/communication skills and a strong commitment to and passion for our multicultural, underserved patient population. Visit www.CHAproviders.org to learn more and apply through our secure candidate portal. CV and cover letter may be sent directly to Melissa Kelley, CHA Provider Recruiter via email at [email protected] CHA’s Department of Provider Recruitment may be reached by phone at (617) 665-3555 or by fax at (617) 665-3553.